Restoration & service of MG, Triumph, Morgan & other British sports cars. Chemically cleaned and shot-peened to remove all dirt and rust. Upon the return of the engine from the machine shop, we prep the block for reassembly by checking that all head stud holes are adequately countersunk, and re-tapping or heli-coiling any damaged threads, then it is thoroughly cleaned with solvent and soapy water. We de-burr the combustion chamber edges and grind the ports to match the manifolds, also removing any blemishes in the ports (to ensure smooth airflow into and out of the engine). During assembly, all tolerances are carefully checked, and only the best quality assembly lubricants are used. The following new parts are always fitted: Pistons & rings, bearings, camshaft (reground or new), cam followers, timing chain & tensioner, oil pump gears, water pump, clutch assembly. After assembly, the engine is painted and detailed. 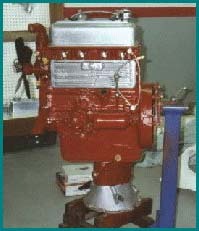 If we are rebuilding an engine for installation in a car, we also insist that the starter, generator (or alternator), carburetors and radiator are all rebuilt. In our opinion, a new engine cannot function properly with old ancillaries. After disassembly, all components are carefully cleaned and inspected for wear or damage. Gear teeth, bearings and synchromesh baulk rings receive particular attention. Once new parts have been obtained, the gearbox is reassembled, once again with careful pre-lubrication. We have an excellent outside source for rebuilding overdrive units, too.